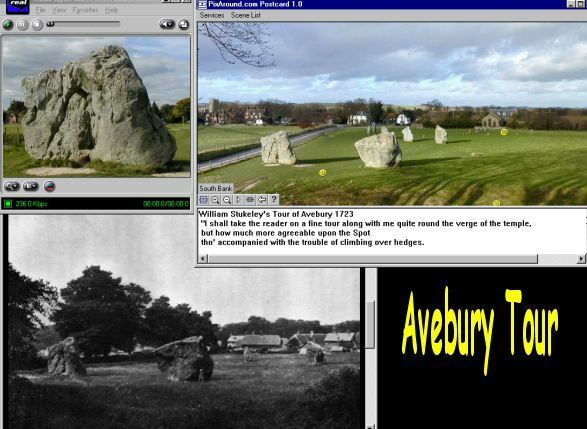 Introducing our CD Rom of over 180 full screen Panoramic scenes covering all of the Avebury stone circle. Using hot spot links you can travel all along the Kennet Avenue to The Sanctuary from the comfort of your own home via your PC. Take a virtual tour along the Beckhampton Avenue to the most recent Excavations at the Longstones field in August 2000, ending at the barrow group at Fox Covert. and details of the latest repairs and restorations. The Marlborough Mount, also called Merlin's Mound, is included in the Local Barrows Tour. The CD has other stone circles including; Falkners circle, Clatford and Winterbourne Bassett in the immediate area. Stonehenge and the surrounding barrows. and the magnificent Stoney Littleton near Wellow in Somerest. White horse scenes include; Cherhill, Milk Hill and Dragon hill at Uffington. John Aubery & William Stukekely plus various others who have visited through out the years. Black & white photos from 1870 onwards including Alexander Keillers restorations in the 1920's. along with several other relevant text's on Avebury. The CD is organised into 6 seperate 'Tours'. Avebury Only, Kennet Avenue, Beckhampton Avenue, Local Barrows, Long Barrows, Other Nearby Stone Circles.